*****!!! We are kindly asking you to sign up for this activity only if you are surely coming, and to do so by February 6 (Wednesday night)! This will help with further planning of the event! We left last activity of the group with full tummies, smiling faces and satisfied hearts! Let's do it again this month! 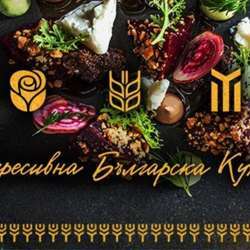 We've organized for you a lunch activity with a Progressive Bulgarian taste at a restaurant that's very warm and cozy, yet located in the center near Saint Nedelya church, TZUM and Balkan Hotel Sofia (ex Sheraton)! Protected content restaurant has a wonderful variety of traditional Bulgarian meals prepared and served in a very modern and unique way! You WON'T regret joining this lunch activity! We'll be looking forward to meeting you at the restaurant - "Knyaz Boris I" 105! Don't forget your business cards! We are planning again to give a minute to each and every attendee separately to introduce themselves as well as their business! *!!! We are kindly asking you to sign up for this activity only if you are surely coming, and to do so by February 6 (Wednesday night)! This will help us with further planning of the event! *We are kindly asking you to have in mind at least 10% tip for the service at the place! Thank you for taking time to read all from this invitation!